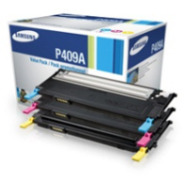 The Samsung CLT-P409A Value Pack Color Toner Cartridge consists of 1 x cyan, 1 x magenta and 1 x yellow toner cartridge. Each yields up to 1,000 pages. Samsung color laser supplies are designed to maximize the machine performance. Constantly redesigned and improved Samsung supplies provide best performance, reliablility and outstanding color printing quality. Its unique design & enhanced technology offers ease-for-use features and smart technology.